The biggest-ever trial of drugs based on cannabis has confirmed the belief of multiple sclerosis patients that they can ease their symptoms. The study, of more than 600 patients, published in the Lancet medical journal, also provided some evidence that they boosted mobility. Other physical proof of the drugs' effects on symptoms did not emerge. 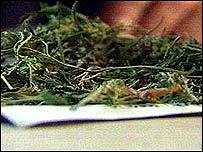 A scientist working on the trial said that study had made NHS prescribing of cannabis-based drugs more likely. 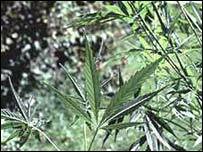 MS patients have been saying for years that smoking cannabis relieved some of the symptoms of their condition. These included "spasticity" - painful spasms and stiffness of the muscles, which make moving very difficult, as well as tremor and bladder problems. Some MS patients are even prepared to break the law to obtain cannabis illegally. The trial, funded by the Medical Research Council, was set up five years ago in an attempt to provide hard evidence either proving or disproving these claims. A total of 657 patients, all with some muscle "spasticity" were recruited, then given either cannabis extract, containing all the chemicals in the street drug, a synthetic copy of one "cannabinoid" chemical, called THC, or just dummy pills, with no active ingredient. The spasticity of each patient was measured before and during the 14-week trial using a special scoring system, and the patients were asked whether they noticed any improvement in their condition. In addition, patients were timed walking a set distance to see if the drugs might have any effect on their overall mobility. The results were mixed. The "objective" scores of spasticity did not improve significantly, even in those patients given the active drugs. There was a slight increase in mobility among the patients on the drugs. But when the patients were quizzed on how they felt during the trial, those taking the cannabis-based medication said they believed a significant improvement had taken place. They had registered improvement in pain, spasm and spasticity, and sleep quality. The researchers concluded that, despite not having much objective "proof" of the physical effects of the drug, there remained evidence it could be "clinically useful" in treating some MS-related symptoms. Dr John Zajicek, from Peninsula Medical School in Plymouth - one of the centres leading the trial - told BBC News Online the study laid the foundation for future research into cannibinoids. "My own interpretation is that there is enough evidence for the drug companies to take it forward to the regulator in the UK. "We believe it may benefit some people with MS."
He said: "At the end of the day, we have to listen to what the patients are saying. That is what being a good doctor is all about." The results of the study have been welcomed by charities working for MS patients. Chris Jones, the chief executive of the MS Trust, said it was "frustrating" that there was no clear physical proof that cannabinoids helped relieve spasticity. But he added: "Overall, we believe that this study, combined with others which demonstrate symptomatic improvement, provides convincing evidence that cannabis may be clinically useful." Mike O'Donovan, from the MS Society, added: "These improvements to quality of life can make a significant difference to people with MS, whose choice of treatments is very limited. "On the evidence now available, the MS Society believes those who might benefit should be able to have treatment prescribed on the NHS. We also believe that further research into cannabis-derived medicines for MS should be vigorously pursued." One drug company has already applied, on the basis of its own clinical trial, for a licence for a cannibinoid drug for MS.
Other research into cannabis-based medication is continuing, looking at its effect on Alzheimer's disease, general post-operative pain, and wasting associated with Aids. Modern cannabis medications do not produce a "high" - the psychoactive ingredients are either missing or delivered in a much lower dose than in the street drug. "Doctors believe cannabis could have an important use in the treatment of MS"